What's The Best Crate Engine? There once was a time when engine swaps were limited to what you could find at the pick-n-pull. Now there's an entire industry devoted to pumping out 427s, 350s, 351s, 302s. So many choices, but what's the best crate engine? 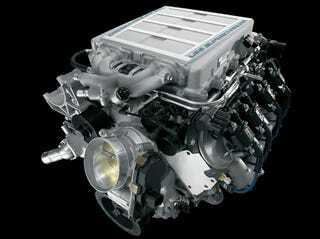 It's probably no shock we think its the LS9 crate motor. The lightweight supercharged 6.2-liter V8 that powers the Corvette ZR1 to super car status would fit nicely in any number of engine-less vehicles. For a shade over $20K GM will treat you to one with almost everything you need (ignition system, exhaust manifolds, supercharger assembly, dry-sump oil pan). That's 638 HP right of the box. Not to mention, it's gorgeous. It's like cut-a-hole-in-the-hood-of-your-39-Mercury to show it off kinda gorgeous. Of course, this has us thinking. Maybe the real question should be — what the hell would you put it in?